Ultimate Gluten Free: Does Glyphosate Cause Celiac Disease? Actually, No! A 2013 article by A. Samsel and S. Seneff claims that exposure to the herbicide glyphosate (the active ingredient in Roundup) is the cause of several diseases, especially celiac disease (Ref. 1). This has recently been causing quite a stir on the Internet and is obviously of concern for celiacs. I have reviewed this article, together with a number of previous papers by Dr. Seneff, and I strongly believe that her claims are not supported by the current evidence. I cannot state this more strongly: this article appears to be an exercise in political activism and does not deserve to be in a legitimate scientific journal. In my opinion, this kind of alarmism is unethical and irresponsible. There are literally dozens of claims and ideas proposed in this article, all with very weak evidence or rationale. This article is a series of wild speculations, rather than a logical hypothesis based on the available research. This is not the place to go into a detailed critique (that would probably take days! ), but, briefly, here are a few examples of why I don’t consider this to be a valid scientific assessment. Claim 1: “Celiac disease, and, more generally, gluten intolerance, is a growing problem worldwide, but especially in North America and Europe, where an estimated 5% of the population now suffers from it.” This is not true. While the prevalence of celiac disease has increased, the 2009/2010 estimate of prevalence of nonceliac gluten sensitivity in the general U.S. population is about 0.6% (Ref. 2). Claim 2: “Celiac disease patients have an increased risk to [sic] Non-Hodgkin’s Lymphoma, which has also been implicated in glyphosate exposure.” This is only half true: the risk of Non-Hodgkin’s Lymphoma in celiac disease patients has declined dramatically over the past several years (Ref. 3). So, contrary to the authors’ claim, there is no evidence for a link with glyphosate exposure (unless, of course, glyphosate prevents cancer!). Claim 3: “Glyphosate is known to inhibit cytochrome P450 enzymes.” This is the main theme of the paper, since the authors argue that inhibition of P450 causes some kind of toxicity. This is deceptive! Glyphosate inhibits some P450 enzymes in plants, but, for some reason, the authors fail to mention the most extensive study of these enzymes in mice and humans. In this case, three major human P450 enzymes are not inhibited by glyphosate (Ref. 4). Claim 4: “Deficiencies in iron, cobalt, molybdenum, copper and other rare metals associated with celiac disease can be attributed to glyphosate’s strong ability to chelate these elements.” Again, this is deceptive. Yes, glyphosate can bind to a variety of metals, but no evidence is presented that this is relevant under real conditions found in the human digestive system. What Is Glyphosate, and Why Is It So Popular? Glyphosate is the active ingredient in the herbicide Roundup, made by Monsanto Company, and has been on the market for about four decades. For several reasons, it is the most widely used herbicide around the world: 1) it is very effective when sprayed on a wide variety of weeds; 2) it is one of the safest substances used in agriculture (conventional or organic); and 3) it is cheap. In recent years, crops have been introduced that have been “genetically modified” (GM) to be resistant to glyphosate. Weeds in these crops can be killed by glyphosate, while the crops (typically corn, soybeans or canola) are left unaffected. Understandably, this increased use of glyphosate has raised the question of whether it might be affecting our health. I try to follow this field closely, since I’m particularly interested in nutrition and its role in human health. I have found no scientific reason to conclude that the herbicide-resistant food crops on the market are any more or less safe than their herbicide-sensitive counterparts. Is There Any Direct Evidence for a Connection Between Glyphosate and Celiac Disease? The paper includes dozens of speculations but offers surprisingly little evidence for a celiac disease connection. Only one figure in the paper shows any information about celiac disease. Figure 1 is a chart that compares the number of celiac disease hospital discharges with the reported glyphosate use on wheat—see the adjacent chart. Unfortunately, the sources of the data used for this chart were not provided, so it is hard to verify. This is highly unorthodox: usually it is an absolute requirement to show how data were obtained for a scientific article! A threefold increase in hospital discharges for celiac disease diagnoses is shown, but this chart is deceptive: the number of biopsies is simply an indication of the number of diagnostic tests performed, not the overall prevalence of the disease. In fact, there is very little precise information about how the prevalence of celiac disease has changed over time. It is well known that doctors have performed more biopsies over the past few years, and, thankfully, many more cases of celiac disease are now being successfully diagnosed. But this is not a measure of the overall prevalence of the disease in the general public. In fact, the latest estimate is that only about 15 percent of cases in the U.S. have been diagnosed (Ref. 2). The information in the above chart does not provide evidence that glyphosate causes celiac disease. Since celiac disease takes years to develop, one would expect the increased level of exposure to occur years prior to seeing an effect. There is no reason to assume that glyphosate would trigger celiac disease “instantly.” If anything, the celiac disease and glyphosate trends should not overlap! Also, there is no evidence presented to show the actual levels of exposure to glyphosate exposure, and the authors fail to cite the most relevant study that measures this (such as Ref. 5). No other data on celiac disease are presented in the article; instead, the authors go on to speculate about all kinds of other conditions, but these are not relevant to the main claim of the paper and seem to be just a distraction. Is This Article Even “Science” at All? 1. Samsel and Seneff make one of the most basic errors in science: they assume that if two things follow a similar trend, then there must be a cause-and-effect relationship. Wrong! The ideas in this paper are often distorted by presenting one single association while neglecting to show other available evidence that would invalidate their assumptions. This is scientifically dishonest. 3. The authors also seem to be unaware of the simple concept that large doses of any substance are more toxic than small ones. This is Toxicology 101. Water and arsenic are both toxic, depending on the amount consumed. Giving test animals massive amounts of a substance is not the same as the effect of a minute trace of that substance that may inadvertently enter the human body, yet the authors fail to make the distinction. They also make no effort to discuss the known levels of exposure to traces of glyphosate and how they compare to the available toxicology data. The one paper that they do mention (Ref. 6) involves treating human cells cultured in a dish with varying amounts of glyphosate. But they fail to point out that a toxic effect was seen only at a vastly higher level than would result from glyphosate in the diet—similar to the levels in a bottle of undiluted Roundup herbicide, something that I would not recommend! My very rough estimate is that levels of exposure to glyphosate that we are exposed to could be at least 10,000-fold less than the amount used in the toxicology study. 4. “Prevalence” is not the same as “incidence,” but the authors seem to confuse the two.Prevalence of a disease is a measure of how common the disease is in the general population. For example, the prevalence of celiac disease is currently estimated to be about 1 percent in many countries. Incidence is a measure of how many new cases are diagnosed in a given time period. In the case of celiac disease, only about 15 percent of the cases (prevalence) in the U.S.have been diagnosed. Fortunately, doctors are getting better at diagnosing the disease (incidence), and more people are being tested using an intestinal biopsy. This is good news. 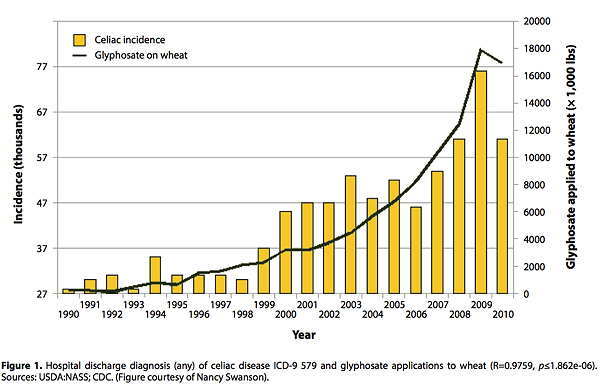 There is no reason to think that changes in glyphosate exposure would change how well celiac disease is diagnosed. The authors do not address changes in overall prevalence. 5. Glyphosate has been used as an herbicide for decades and is one of the most extensively studied chemicals in our environment. But the authors fail to cite the literally hundreds of papers and reports that address the safety and biological activity of glyphosate. This leaves me with the impression that the authors have little interest in an objective analysis of the available information. 6. In this paper, the authors show a striking lack of curiosity about whether their ideas are actually true or not. No experiments whatsoever are proposed that would be able to validate their ideas—or invalidate them. But this is the cornerstone of how actual science is done! Science involves first looking at the available information, then developing a hypothesis and then designing a definitive experiment. It is as though the authors believe that systematic searching for potential associations is all that’s needed. This issue would surely have been rectified if the authors had chosen to collaborate with experienced experimental scientists in the relevant areas of disease and toxicology. Who Are the Contributors to This Paper on the Relationship Between Celiac Disease and Glyphosate? Stephanie Seneff has a PhD in electrical engineering and works at the MIT Computer Science and Artificial Intelligence Laboratory. She appears to have shifted careers to apply her computing skills to analyzing publicly available databases of health information, especially for controversial topics such as vaccines, GMOs and glyphosate. As far as I can tell, she has no obvious experience in any of the biological sciences or toxicology and has never published any biological research of her own. Given this lack of experience, it is remarkable that she typically chooses coauthors who also do not have biological research experience. Dr. Arthur Samsel, the coauthor of this paper, is a retired consultant who worked at Arthur Little (again, with no obvious experience in biology). All the figures in this paper were created by Dr. Nancy Swanson, a physicist, formerly employed by the Navy and currently a company owner and expert in optical systems. It is astounding that Dr. Seneff chose not to include either a toxicologist, an expert on glyphosate, or an expert in celiac disease research as a coauthor on this paper. The only person acknowledged for her input on celiac disease is Jennifer Moeny; no offense to Ms. Moeny, but I am not aware that she has ever been involved in any kind of scientific research, let alone celiac disease. Stephanie Seneff’s work is funded by Quanta Computers, Taipei, Taiwan, under the auspices of the Qmulus Project, but I have not been able to learn more about this project and how it relates to the current paper. What Kind of Journal Is Interdisciplinary Toxicology? Where Can You Find This Paper? Trends and Associations Do Not Imply Cause and Effect! On a lighter note, here is a great example of why it is important not to overinterpret trends. If you look hard enough, you can find two trends that match perfectly, even though they have nothing at all to do with each other. 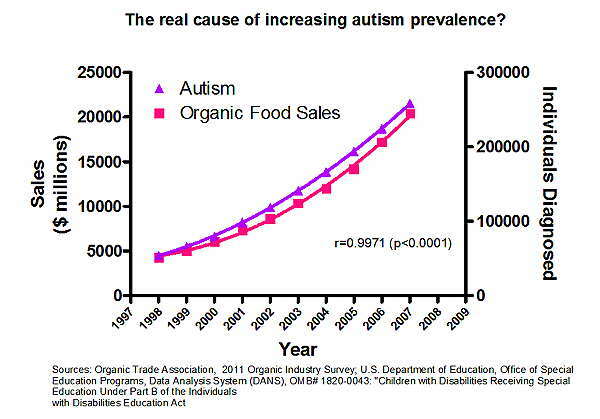 I wonder, if Samsel and Seneff had seen this chart, would they have concluded that organic foods cause autism, or that people with autism are the major consumers of organic food? It’s always tempting to try to find something to blame for a particular disease or condition, but it’s important to be skeptical, unless the evidence is rock-solid. In my opinion, this is science of the lowest quality, apparently published in a questionable scientific journal. Perhaps I have dwelled too much on this topic—this blog is definitely not meant as a personal attack, even though the language may be strong. However, I believe that it is vital to debunk false claims by anti-GMO activists, especially if they attempt to exploit the current public interest in gluten and celiac disease. Let’s hope that in this case, most people will realize that bizarre speculations belong in magazines next to supermarket checkouts. Ref. 2: Rubio-Tapia et al. The prevalence of celiac disease in the United States. Am J Gastroenterol. 2012 Oct;107(10):1538-44. doi: 10.1038/ajg.2012.219. Ref. 3: Gao Y, et al. Lymphoma risk following celiac disease diagnosed in Sweden from the mid-1970s to the early 21st Century. Gastroenterology. 2009 January; 136(1): 91–98. Ref. 4: McLaughlin LA et al. Functional Expression and Comparative Characterization of Nine Murine Cytochromes P450 by Fluorescent Inhibition Screening. DRUG METABOLISM AND DISPOSITION (2008) Vol. 36, No. 7 1322-1331. Ref. 6: Gasnier C et al. (2009). Glyphosate-based herbicides are toxic and endocrine disruptors in human cell lines. Toxicology 262: 184–191. Update added February 27, 2014.